If you are interested in joining the TaDa! 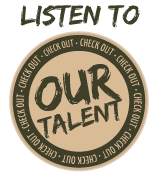 Voiceworks roster, please submit your COMMERCIAL VOICE DEMO to newtalent@tadavoiceworks.com. Due to the volume of submissions we receive, we only will respond to talent who are being considered for representation. We seldom add to our roster but we keep all demos on file for consideration when a place on our roster becomes available. Please no phone calls.